Cambodia's Minister of Tourism Thong Khun (L) speaks to reporters after a meeting in Phnom Penh to discuss ticket revenue at the Angkor Wat temple complex, Nov. 19, 2014. A parliamentary commission leader wants Cambodia’s tourism ministry to manage revenue generated by the country’s iconic Angkor Wat temple complex, amid concerns that the government is losing money by retaining a private company to oversee ticket sales. “I request that his excellency [Tourism Minister Thong Khun] manage tickets for tourists who visit Angkor Wat,” Yem Ponhearith, chairman of the Commission on Education, Youth, Sport, Religious Affairs, Culture and Tourism said after a closed-door meeting on Wednesday. “The government has spent a lot of money, and we shouldn’t let a private company take advantage of selling the tickets. I urge the Ministry of Tourism to sell the tickets,” said the chairman, who is a leader of the opposition Cambodia National Rescue Party (CNRP). In the past, the opposition had charged that Angkor Wat ticket sales figures had been underreported. A quasi-government group, Apsara Authority, which is responsible for conservation and tourist development of the Angkor Wat in Siem Reap, has contracted private firm Sokha Co. to oversee ticket sales at the temple complex. The company is owned by prominent businessman and former ruling Cambodian People's Party (CPP) lawmaker Sok Kong. Sok Kong is chief executive of Sokimex Group, a conglomerate involved in petroleum product imports, infrastructure development, hotel management, residential projects, and a helicopter airline. After the meeting Wednesday, Thong Khun told reporters that he did not know how much ticket revenue Angkor Wat generated, because revenue was managed by the finance ministry and Apsara. He said the tourism ministry could only claim that about 4.2 million people visited Angkor Wat last year, and that revenue from tourism-related services—such as hotels, restaurants, and transportation—which employ about 50,000 workers, reached U.S. $2.5 billion annually. “I have requested that the commission ask Apsara Authority directly,” he said. But Thong Khun said he couldn’t immediately respond to Yem Ponhearith’s request that the tourism ministry manage ticket sales. Deputy Prime Minister Sok An, who is also Minister for the Office of the Council of Ministers, supervises the Apsara Authority. 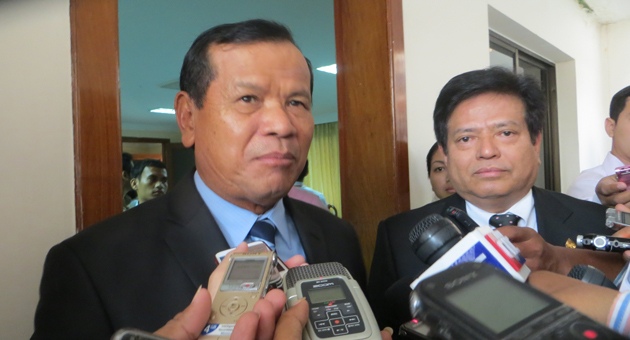 Kem Sokha, deputy president of the opposition Cambodian National Rescue Party (CNRP), had last year accused Apsara Authority of underreporting revenue. Bun Narith, Apsara Authority’s general director, dismissed the allegations as baseless, the report said. Reported by Ouk Savborey for RFA’s Khmer Service. Translated by Samean Yun. Written in English by Roseanne Gerin. In the web of lies and corruption in the communist, banana kingdom of cambodia, the monkeys in charge can only point fingers at each other while dipping and stealing from the kind, smiling, indifferent, power envious water buffaloes (the people). It's HOPELESS and SAD that the water buffaloes do not recognize that they HAVE brains and have back bones of human beings, WHO CAN USE their BRAINS AND improve their LIVING CONDITIONS. These water buffaloes love to be drown in their own stupidity and wake up in their next life...HOPELESS while the monkeys have ALL the fun and stuff their bank accounts in other countries. TAKE some responsibility and grow some balls. Crying over spilled milk and playing victims are not VIABLE strategies, dear fellow cambodians. Crazed monkeys need to be put to sleep.